After the recent Discover South Africa event Manuel and Andre (Lostly) grabbed a bit of cheeky late night studio time to work on an idea. In what seemed like a matter of minutes, those present in the studio were dancing into the daylight hours as these two production goliaths performed their magic and Lost Man was born. Lost Man is an example of creative spontaneity at its very best. With both artists working on new albums and solo single projects, this cheeky little unplanned bonus serves as yet further proof of their talent and keeps us all on our toes, eagerly waiting to hear their next sonic masterpiece. 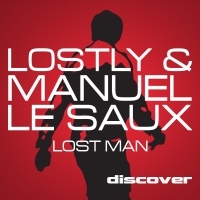 'Lost Man' is available now from Beatport and iTunes.